This setting doesn't impact when dead planets fade out on zoom out like the other settings do. Makes for a cluttered zoom out no matter what on my machine. I just searched Google for this issue and found this post. I want to confirm that the dead planet zoom setting is not working properly. As a follow up, It seems like the dead planets maybe responding to the habitable planets zoom setting instead. Had another look into this issue post Retribution launch. I noticed that there are two types of dead planets. Ones with heavy and light borders (not sure what the difference is there). The heavy bordered ones stay on the map, where as the light ones disappear as expected. Have you looked at their class? Perhaps the thicker borders are higher class and the seeing is tied to lower class levels. Szemis description of the bug is accurate. 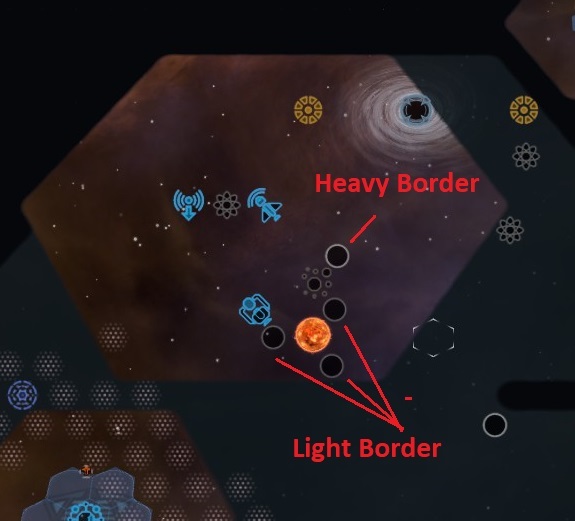 Heavy and light bordered dead planets are both CLASS 0. And yet, the heavy bordered dead planets are treated by the zoom settings as though they are habitable planets. This may seem minor, but when the main UI is cluttered with hundreds of dead planets, which easily out number every other icon, it spoils gameplay. While checking this out in a game, I noticed something that is visible in the screen shot in Reply #3. The dead planets with the light border are all in the inner ring around the star, and those with the heavy border are all in the other rings around the star. I can't think of any reason why they should be different, but they are. Maybe that is a clue to what is causing the problem. So, this behavior was actually intended, but I am going to change it so all "dead" planets will fade out at the same level. Because you are right it helps clean up the clutter. That said let me explain why they were different, just FYI. When a system is generated, there are Planets, and Dead planets placed. This has to do with resource and habitable world generation. Dead planets are sometimes swapped out with Tulium, depending on your resource likelihood settings. Dead planets are almost always in the first ring of a system, think Mercury. Planets, the ones with the wider ring are placed with the possibility of being habitable, once again, depending on your settings. If these come out as below Class 3, they are then flagged as Dead, and they play the same as the other dead planets. But because they are generated in a separate pass they had there own Icon and had their own threshold for the fade out in strategic view. Regardless, I have changed all dead non-colonizable planets to fade out at the same time. This will show up in the next patch. Your explanation was solid. Appreciate the change!